Another day, another mid-engine Corvette sighting. Except this isn’t some blocky mule running around a gas station with a tarp on its face, this appears to be the new Corvette C8.R race car. We got to hear a clip of the thing running at Road America yesterday and it was delightfully puzzling: It didn’t sound like a typical American V8, though many of you thought that it sounded like a flat-plane V8. Not out of the realm of possibility! Anyway, beneath that camo livery, you can see a silhouette that is most definitely mid-engined. Plus, it has huge vents cut into its side, presumably to channel air into the engine that’s situated behind the driver. 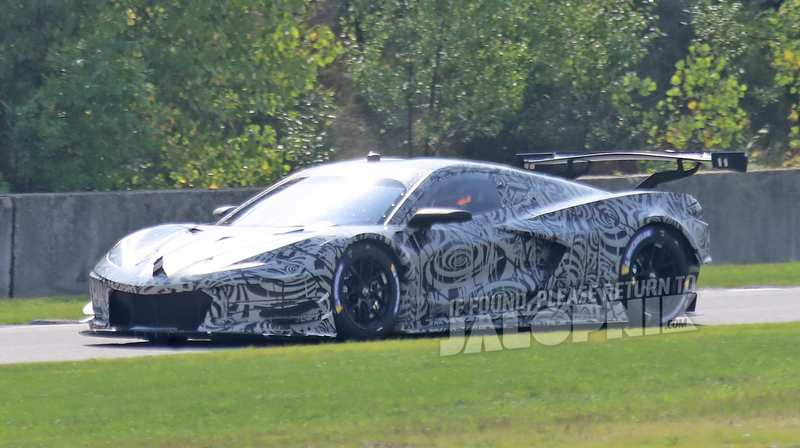 All of that, plus the massive wing and diffuser on the back, mean that this is almost certainly the upcoming C8.R. Which means that the production version won’t look too far off from that. There’s no official word yet on what will power the new Corvette or its race car counterpart, but I can say this: The mule looks awesome. Is This The Sound Of The Mid-Engine Corvette&apos;s Twin-Turbo V8?